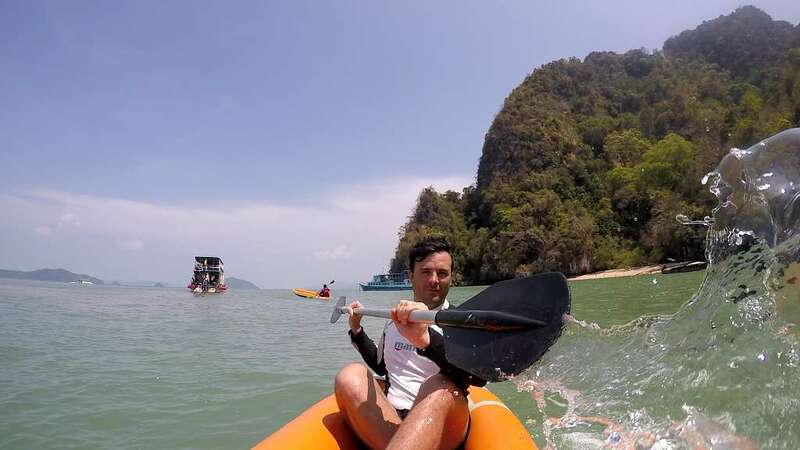 Our Phuket Sea Canoe day trip to Phang Nga Bay is a great Sightseeing tour for the whole family and let you bring back plenty of good memories. You get to sea canoe through caves and mangrove lagoons. You see bats, caves & monkeys on the islands of Phang Nga Bay. Sea eagles follow the boat. Relax & swim on white sand beaches. The day trip also includes a quick trip to James Bond Island. Return transfers from Phuket hotel in main areas ** by licensed air con mini bus! Delicious Thai buffet lunch, snacks, soft drinks and fresh fruit served on boat! Accident insurance, life jackets and experienced English speaking sea canoe tour guides! Phang Nga national Park fees. THB 200 per person (min. 2 person) for Phuket Town, Rawai, nai Harn, Leamson, Naithon, Naiton & Nai Yang Beach. THB 800 per car for Hotels in Cape Panwa, Koh Sirey, Leam Hin, Ao Por, Kokloy. Private Return transfers by AC mini van from all hotels in Phuket! Your Private Boat for exploring Phang Nga Bay! Delicious Thai buffet lunch, snacks, soft drinks and fresh fruit served on board! Accident Tour insurance, life jackets & experienced English speaking sea canoe guides! 07.30 – Your Phuket sea canoe adventure starts with pick up from your Phuket hotel and transfer with air con mini van to Klong Kian Pier north east of Phuket Island On the way you cross Sarasin Bridge, that offers great views. 09.30 – Boarding and departure for Phang Nga Bay. A very scenic cruise with plenty of photo opportunities. 10.00 – Stop at Panak Island and island exploration by kayak. 11.30 – Vist at James Bond Island, followed by lunch. A delicious Thai buffet served on board. 14.00 – Visit at Hong Island for more sea canoeing and exploring the caves “hongs”. 15.30 – Enjoy the afternoon on one of the beaches in Phang Nga Bay. Time for self paddled kayaking, swimming or relax on the beach. 16.15 – Back at Klong Kian Pier and transfer back to your Phuket hotel. * Above Phuket Sea Canoe Tour program & timing may be subject to change depending on suitability, tide, sea & weather condition. If you prefer less people on your Phuket tours and like to explore the beauty of the islands avoiding the big crowds check out John Gray’s Hong By Starlight Tour.